The UFC has announced that Khabib Nurmagomedov will defend the UFC lightweight title against Conor McGregor on October 6th at UFC 229 in Las Vegas, Nevada. One of the biggest fights in the history of the UFC was announced during Friday’s press conference in Los Angeles. 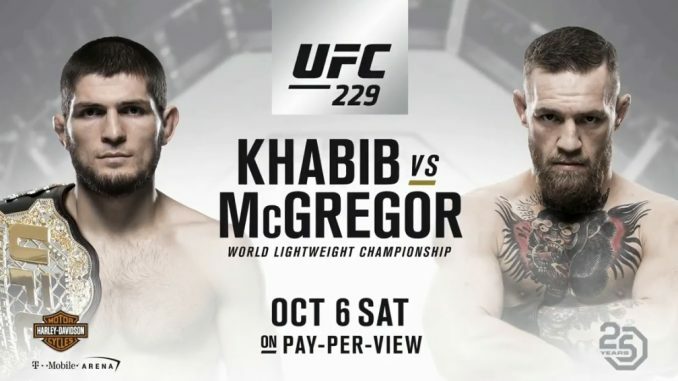 At the end of the presser, a video aired to formally announce that Conor McGregor will challenge Khabib Nurmagomedov at UFC 229 for the lightweight title. The fight will take place on Saturday, October 6th at the T-Mobile Arena in Las Vegas, Nevada. After deflecting a question at the start of the press conference, UFC president Dana White would state that it was the fight to make and they were “working on it”, prior to the announcement at the end. Nate Diaz, who was in attendance for the press conference to announce his bout with Dustin Poirier in November, left the stage during the Nurmagomedov-McGregor announcement and tweeted, “I’m not fighting on that show fuk the @ufc”. The October 6th fight will be McGregor’s first mixed martial arts bout since UFC 205 in November 2016, where he defeated Eddie Alvarez to become a double champion at the featherweight and lightweight divisions. He boxed Floyd Mayweather Jr. last August that generated a reported 4.3 million buys on pay-per-view. Footage of the bus altercation in Brooklyn from this past April was the focus of the fight promo that aired during the press conference.